The bread from this bakery was sold at The Stores which is now a private house called Hollow Stones, north of the school, and the bakery was in the property known now as Spring Hill which is on the north side of Hollow Stones. F. J. Williams sold the property to S. E. White in June 1935 and this was possibly when the bakery ceased operating. In October 1939 the property was sold to A. S. P. Elsmore and at that time there were 5 parts to the property. 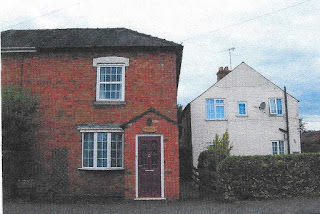 The First was the “semi-detached shop and dwelling house known as The Stores with garage outbuildings and garden land belonging thereto.” The second was “a semi-detached dwellinghouse known as Spring Villa with the outbuildings and garden … on the south side of The Stores.” Mr. P. Shaylor, the village policeman, was a tenant there. 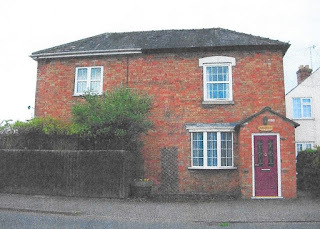 The third was “a semi-detached dwelling known as Spring Cottage”, F. Phelps was a tenant there. The fourth was “a detached dwelling house with garage and outbuildings” on the north of the Stores known as Spring Hill. E. Rowland was a tenant there. The fifth was “a piece or parcel of land bounded on the north by the garden of The Stores” occupied by Mr. Collett. It appears that each part of the property may have been sold separately at this time. To read more of this research, click here. This shop was north of the school and halfway between Greens’ shop, later Ladygo Stores, and the shop on the corner of Moseley Road. It was where a private house called Hollow Stones is now. In living memory the people who ran this shop were the Colletts, Timms, Wilkes, and Mrs. Walker. It was always a general store which sometimes sold groceries. A villager who had lived in Hallow all her life told me that she had been friends with Freda Williams, daughter of Frank, and used to play in the play room which was above the shop and she loved the smell of fresh bread coming from the bakery at the back. Also Mrs. Williams made lovely cakes. She said that there was also a granary and stables there. F. J. Williams sold the property to S. E. White in June 1935. There is evidence of a lease between S. E. White and Henry E. Collett in March 1936 and Trade Directories from 1937 onwards show H. E. Collett as a shopkeeper in Hallow. In November 1950 A. S. P. Elsmore sold The Stores to Mrs. Kathleen Maud Simpkin whose husband was noted as J. C. Simpkin, a grocer. Documents show that Mrs. Wilkes bought The Stores in December 1951, C. W. Timms in September 1961 and Mr. and Mrs. Walker in July 1971. Competition from the other stores in the village, The Stores being halfway between Ladygo Stores and the shop on the corner of Moseley Road, caused the demise of the shop in 1973/74, when it became a private house. The stabling at the back still belonging to The Stores. 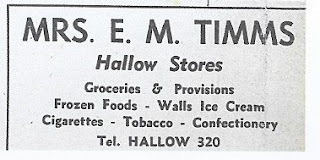 Many people have puzzled as to the change of name from The Stores Hallow to Hollow Stones and I have been advised that it was just an administrative error which was not corrected. The Garage Stores was in No. 1 Archbell Cottages, next to Jenkins’ garage. In the late 1950s and early 1960s, the shop sold groceries, greengroceries and sweets and was run by Mrs. Brant and her son, Peter. You were able to get a 6d savings stamp at this shop when Mrs. Jenkins was there. Annie Crowe was thought to have run the shop before Mrs. Jenkins. The boys in the village would wrap a farthing in silver paper and pay for something in Annie’s shop and get change from six pence. In the trade directories for 1928 and 1935 Jane Crowe was noted as a shopkeeper – was this a relative of Annie Crowe or the same person? After the early 1960s the building reverted to a private house and sometime later, it was occupied as a hairdressing business. There was a shop before Ladygo Stores, in the centre of the village, called Green’s shop. It was almost on the same spot but was the main road end of a row of cottages called Southview, which were at right angles to the road. This site probably started with the leasing of a cottage and a garden in 1708 to Thomas Lerigo (Leddigo). Later in 1783 it was noted as two cottages and gardens. This land was sold by Berwick & Co., in 1892 to Joseph Thorpe who was a market gardener living at “The Laurels” on the opposite side of the main road to Southview. The first mention of a shop in the paperwork that I have found is in 1915 when Joseph Thorpe took out a mortgage on Southview Hallow, comprising “a shop and cottage and 3 other cottages and outbuildings (1 recently erected by J. Thorpe), No. 1 and the shop was let to Mr. George Green. From 1921 Mr. Green was noted in trade directories as the shopkeeper of these premises. These properties were bequeathed to Andrew Thorpe, the only surviving son of Joseph Thorpe in his will dated 1926. Edith Jane Thorpe became the owner of the properties in 1940 when her husband Andrew died. Edith Jane married Thomas Henry Colcough in February 1951 and in October of that year sold Southview “that parcel of land 1 acre and 19 perches and a shop and cottage and 3 other cottages and outbuildings erected on said land” to Alice Kate Green, who then occupied no. 1 Southview. (John Green, a descendent said George Green had bought the shop and Kate his wife ran it). She made ice-cream for sale in the shop. The ice for making the ice-cream was collected by Tom Green (John Greens’ father) on his dray from the Ice Works on Bromyard Road. The shop was sideways onto the main road and the entrance was down 3 steps into a garden which went right to the edge of the school property. Jim Wheeler recalls that Green’s shop was the agent for urgent Midland Red Parcel deliveries. Cecil Instans’ dad was given sweets for sharpening the blade on the bacon machine. In the war, morning newspapers were delivered to Mrs. Green’s shop. Alice Kate Green died in 1959 and left nos. 1 & 2 South View together with the goodwill, stock and fixtures and fittings of and in the shop carried on there to her sister Ethel Lancelot for her own absolute use and benefit. Also she left the freehold properties, nos. 3 & 4 Southview together with her furniture and personal effects to her sister Gwendoline Wilde for her own absolute use and benefit. On 26th October 1965 Dolton Bros. Ltd. Bought nos. 1, 2, 3 & 4 Southview and demolished the row of houses and the shop and built on the site. Ladygo Stores is a shop on the main road, in the centre of the village. It is on the same site occupied by a row of houses called “Southview” which included “Green’s Shop”. On 26th October 1965 Dolton Bros. Ltd., the builders, bought nos. 1, 2, 3 & 4 Southview and demolished the buildings prior to building properties in a close called Browne’s Way. The plans included a shop with the frontage along the main road. In July 1966 Dolton Bros. sold the plot with the shop on it to Peter Brant, who had been living at The Garage Stores Hallow. Peter negotiated with Dolton Bros. what was needed in this new shop. The shop was a general store which expanded over the years. 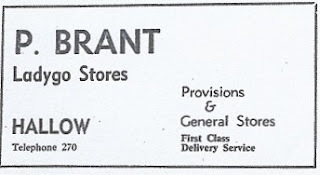 Peter Brant owned the shop until 1972 when he sold it to Mr. & Mrs. G. J. D. Lockhart. There were many changes of ownership over the following years, such as 1981 Mr. & Mrs. W. Clarke, 1983 Mr. & Mrs. G. Skipworth, 1985 Mr. & Mrs. J. S. Gardiner, 1989 D. R. and M. A. Day and J. A. Comley, 1990 Tirath Singh and Sukbinder Singh Kalar and 1995 Michael and Judith Baldwin. The shop had been the subject of applications for changes over the years such as the planning application for Tea Rooms in 1982 which was rejected, a free standing shop sign which was granted in 1984, a shop blind which was granted in 1985, a shop extension to form a store room which was granted in 1987 and an extension to the shop area which was completed in 2016. There was a shop in what is “The White House” in Ladygo Lane. It was known as a sweet shop in the 1940s and Grandad Crowes’ mother was said to have run a shop here. Could this be Jane Crowe? Also Mrs. Lancelot (Joan Green) is said to have had a shop here and sold lard. “The White House” was previously owned by Bob Mason who came to the village in 1964 as the village policeman. In later years after buying the property, Bob said that when work was started on updating the property, there was a covenant that the north wall had to be left as part of the house and a window had to remain in the position where the original window of the shop had been. The Locks sold the property to Mr. & Mrs. Mason in March 1977, then having the name Gracelyn. The Langley’s sold the property to Percy Lock in November 1950, when the house had the name Ellsmere Cottage. In living memory a shop was remembered for selling sweets and also for selling lard. Though I am told that there is no mention in the deeds of the property being a shop. Bob Mason said that there was a three storey house with a clock tower on the site of Gracelyn. A lady lived in this manor house when there was a fire and the top storey was destroyed. The lady escaped down the side of the house and rumour has it that this is how the name Ladygo came into being. Due to research the alternative thought is that it is down to Thomas Lerigo (Lediggo) who leased land in the area in the 1700s. Dyer’s was a business to the north end of the village, reached by a driveway next to the white “Rose Cottage” on the left of the main road, going north. 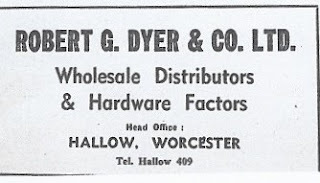 Local people remember Dyer’s as an ironmongery shop which sold pots, pans, buckets and metal bins. One villager recalls buying a metal fence from them in the early days. However, the company was dissolved possibly in 1994 and the latest accounts were filed up to 13th December 1996. 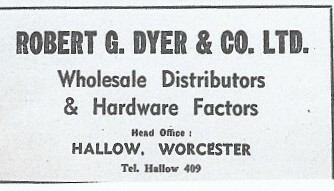 After Dyer left the building, an equestrian supplies company traded there and stayed a few years. When they moved out, a sports company took over the premises as a manufacturing base but did not stay long. They were followed in 2010 by “Hallowood Furniture” which dealt direct with manufactures dealing in oak wood furniture. This company left Hallow in 2012 to occupy a shop in “The Shambles” in Worcester City. Dyer’s building was demolished and a private house was built on the land and it was occupied from 2013. Flats were built on the land belong to Dyers but on the main road. 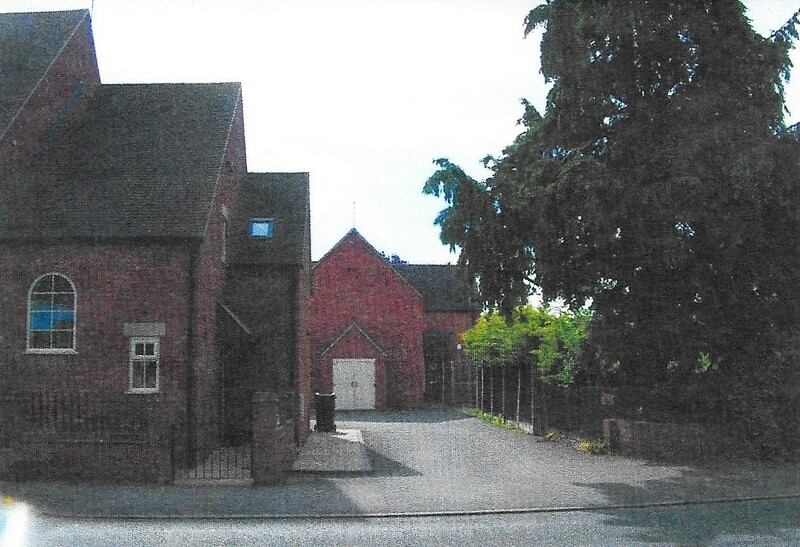 One at “Woodlands” as it is now next to the corner of Broadheath Lane. It was owned by Sidney Griffiths’ father who sold cakes and ice-cream. He is remembered for his long beard hammering away repairing boots and shoes, selling ice-cream in between. This shop had been a drapers shop before that. There was also a shop behind Cleggs garage on The Green and at the side of Pinch Cottage. It sold Paraffin, sweets and cigarettes, and pop. They used oxygen to make the pop fizzy. Granny Smith ran this shop and later Mrs. Davis, Mrs. Cleggs’ mother ran it. After Mrs. Davies it was run in the late 1950s by the Buftons and Mrs. Violet Watkins, Mrs. Bufton’s mother. By 1966 this shop had disappeared. The shop on the corner of Moseley Road. Mr. C. P. Paterson owned this property and sold it to E. I. D. Handley in September 1939. Mrs. Handley ran the shop as a general store and sold newspapers. There was a library at the back of the shop. Mrs. Handley’s son was a pilot in the Royal Airforce during the war. Her shop was the first to sell ice-cream after the war. The flavor was called “Lilly of The Valley” and the ice came from the Ice Works in Bromyard Road. At the end of the 1940s Mrs. Handley sold the shop to T. Lambert who owned the property until he sold it to A. Garfield in the late 1960s. A. Garfield did not own the property for very long and sold it to R. Evans in 1970. Villagers tell us that Mr. & Mrs. Clarke (from Pensax) took over the shop0 from Mrs. Handley in the 1950s, presumably they were running the business as tenants of T. Lambert and A. Garfield. Later the post office was moved to the shop. Mr. & Mrs. Davidge took over the property and ran the shop and Post Office from May 1987 until the business and Post Office was sold in November 2006 to the present owners, Mr. & Mrs. Cooksey. Stallards shop was on the corner at Moseley Turning. It was attached to the bakery there. The shop door was to the left of where the red post box is in the wall of the building. The family business of the bakery and provisions was set up in 1850. Another local said the shop sold household things, including cotton, sweets in big jars, and bacon which was cut out the back. After Mr. Stallard died, Mrs. Stallard carried on the shop but not the bakery. Mr. Willday took over after Mrs. Stallard gave up the business. After Mr. Willday came Mr. & Mrs. Ewins who did not carry on the business but used it as a private house. Pre 1930 this shop was at the end of Yew Tree Villas nearest the road and it was probably a butchers and general stores. When a family came to Yew Tree Villas in the late 1920s to use the property as a dwelling only, there were signs that the cottage had been a shop. It had shutters on the window on the roadside of the building and there had been metal signs advertising Persil, Rinso, Robin Starch and Zeebo on the outside of the wall on the road side. There were also large holes in the ceiling joists, like the holes needed to hang the hooks for drying hams and pork.